Martin Luther King Jr’s famed “I have a dream” speech lasted just seventeen minutes. Most of Shakespeare’s well-known soliloquies – Hamlet or Macbeth – are just a few dozen lines long; and Abraham Lincoln wrote the Gettysburg address on the back of a napkin. In other words, you can say a lot while speaking only a little. The Gettysburg Address is a great example of why brevity is often a very good idea. Lincoln took the podium after a two-hour address by the former Secretary of State, Edward Everett. “Who?” you ask – and well you might. No one remembers that speech because it was too long. Everyone remembers Lincoln’s because it was so well crafted. The secret of being succinct on stage is in the quality of your message. Every word has to be doing some heavy lifting, and none can be wasted. With good preparation you won’t bore anyone – you’ll say what you mean, and do so swiftly. The whole point of speaking is to engage, inform and persuade your audience. Droning on is not the way to do that. 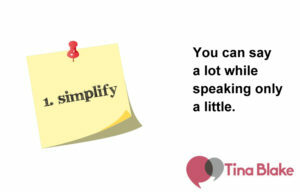 Short, sharp speeches which make their point clearly and without fuss are the best way to make yourself heard. The optimum attention span of an audience who are simply listening to you, without any other distraction, for example watching a video, is 6 – 8 minutes. Of course if you haven’t grabbed them within the first few seconds , you can kiss them goodbye. What the discipline of brevity forces you to do, is be clear. Clarity is the key to all great public speaking – it’s the best route to speaking memorably and persuasively. So the next time you start to write your remarks, think of Lincoln … and remember the fate of Edward Everett. Stay succinct – and be brief.